Visit! It’s one of the most important things you can do when choosing a college. Niagara offers several convenient options throughout the year to visit campus and meet with students, faculty and staff. Appointments are available Mondays through Fridays and some Saturdays. You can also make arrangements to sit in on a class, speak with a faculty member and/or take a guided tour of the campus. 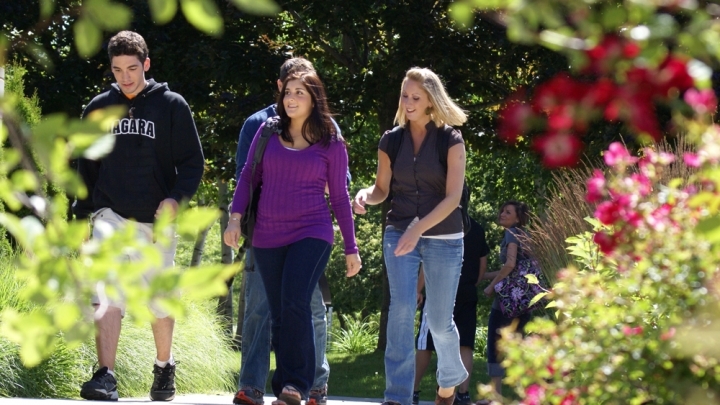 Niagara University's Open House offers you the unique opportunity and freedom to get information relevant to your interests. You have the ability to schedule your day with a variety of presentations on admissions policy, academics and financial aid. Niagara Nights are overnight visits for high school seniors who have been accepted to and are seriously considering attending Niagara University. Students are placed with current NU students in their intended major (if available) for the night, eat meals on campus, attend classes, participate in an on-campus programming event and stay in the residence halls. We are offering you the opportunity to meet one-on-one with an admissions counselor in your area. This is the perfect time to begin building a relationship with the counselor you will be working with throughout the admissions process – and let us introduce Niagara University to you and your family! We invite you to attend a Transfer Tuesday. What is a Transfer Tuesday, you might ask? It is an opportunity for you to visit our campus, meet with a representative from your college, the admissions office, or financial aid to discuss any questions you might have about Niagara. Join our mailing list to learn more about the POWER of NIAGARA. Take a look at our events page to see when our next admissions event will take place.